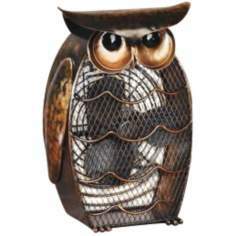 The unique character of this owl tabletop fan make it a fun accent piece. Sculpted in beautifully colored ironwork this figurine fan will add personality to any desk or tabletop. Made with top-quality 20 watt copper-spun motors, this table fan will circulate air to make a personal space more comfortable. .